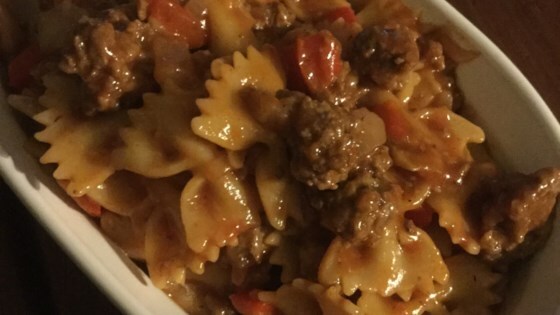 "This is an old recipe, made by my grandmother who lived on an island in the North Atlantic, long before 'goulash' was made with ground beef. It was our typical meal when Mom was rushed to put something hot and tasty on the table. My family and friends use it lots, and I add the grated Parmesan on top to give it a gourmet touch. Nice with a green salad." Fill a large pot with lightly salted water and bring to a rolling boil over high heat. Once the water is boiling, stir in the macaroni, and return to a boil. Cook the pasta uncovered, stirring occasionally, until the pasta has cooked through, but is still firm to the bite, about 8 minutes. Drain well in a colander set in the sink. Heat the olive oil in a large pot over medium heat, and cook the onion and garlic until the onion is soft, about 5 minutes; stir in the green pepper, and cook until tender, about 8 more minutes. Mash the corned beef into the pot, and simmer until hot. Mix in the tomato soup, ketchup, cooked macaroni, salt and black pepper; stir to combine, and bring the mixture to a simmer over medium-low heat. Sprinkle the Parmesan cheese on top, and serve. Macaroni simmers with ground beef and onions in a spicy tomato sauce. GREAT! Be sure to use canned corned beed, NOT corned beef hash. Tried is as written, then substituting cream of mushroom soup for the tomato coup and eliminated the atsup. Love it both ways. Sounds good, but where are you finding the canned corned beef? I have been looking for months for it to make corned beef casserole (like you do tuna casserole). It is not on the shelves. I love this! My mom used to make this same thing when I was a kid, but she used ground beef not corned beef. Very yummy. I followed the directions as best I could but I didn't really like this. I'm not sure what I did wrong, looks just like the picture. The rest of the family didn't care for it either. Added 1 can drained diced tomatoes. Added spices- basil, oregano, garlic. Needs a bit more sauce- maybe 1 can tomato sauce. Only need to sprinkle cheese on top at the end. My family LOVES this recipe. The only change I really made was using Ground Beef instead of Corned Beef and I added a little more garlic. YUMMY!! Easy dish and very cost effective. Next time I'm putting in more garlic and maybe some mushrooms. I did add an 8 ou. can of tomato sauce.